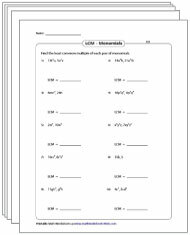 This extensive collection of worksheets on LCM is designed and recommended for students of grade 6 through grade 8. The exercises covered in this module include finding common multiples, finding the LCM for a set of numbers and much more! List the first ten multiples for the given pair of numbers. Then, identify two common multiples for both numbers. 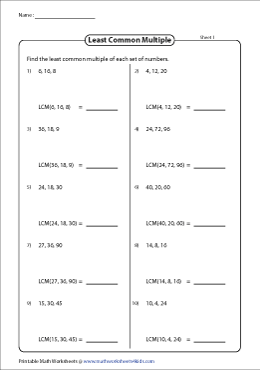 Solve the LCM worksheets that contain five problems each. 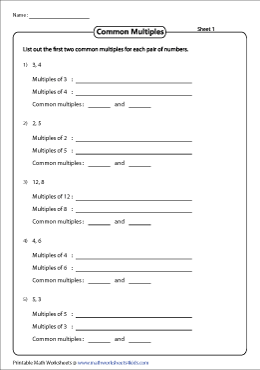 Learners are required to list the first ten multiples for each set of two numbers featured in the questions. Next, they need to determine the LCM by finding the smallest common multiple that is divisible by both numbers. 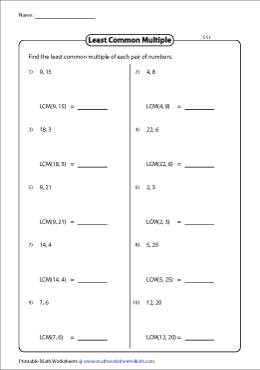 This set of two-level worksheets requires students to find the LCM of a pair of numbers. Find the least common multiple for each set of three numbers. Use the answer key to validate your responses. Each worksheet has 10 sets of numbers. 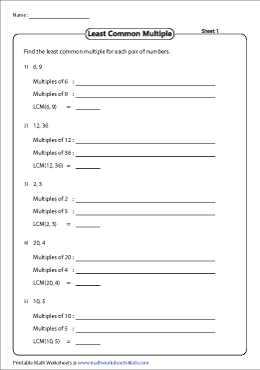 Figure out the least common multiple with these LCM of polynomials worksheets. Learn to find the LCM of two, three monomials and polynomials segregated into easy and moderate levels. Find the other polynomial in the given linear, quadratic or polynomial expression as well.